With Azure Media Services, you can secure your media from the time it leaves your computer through storage, processing, and delivery. You can use Media Services to deliver your content encrypted dynamically with the Advanced Encryption Standard (AES) by using 128-bit encryption keys. You also can use it with common encryption (CENC) by using PlayReady and/or Widevine digital rights management (DRM) and Apple FairPlay. Media Services provides a service for delivering DRM licenses and AES clear keys to authorized clients. 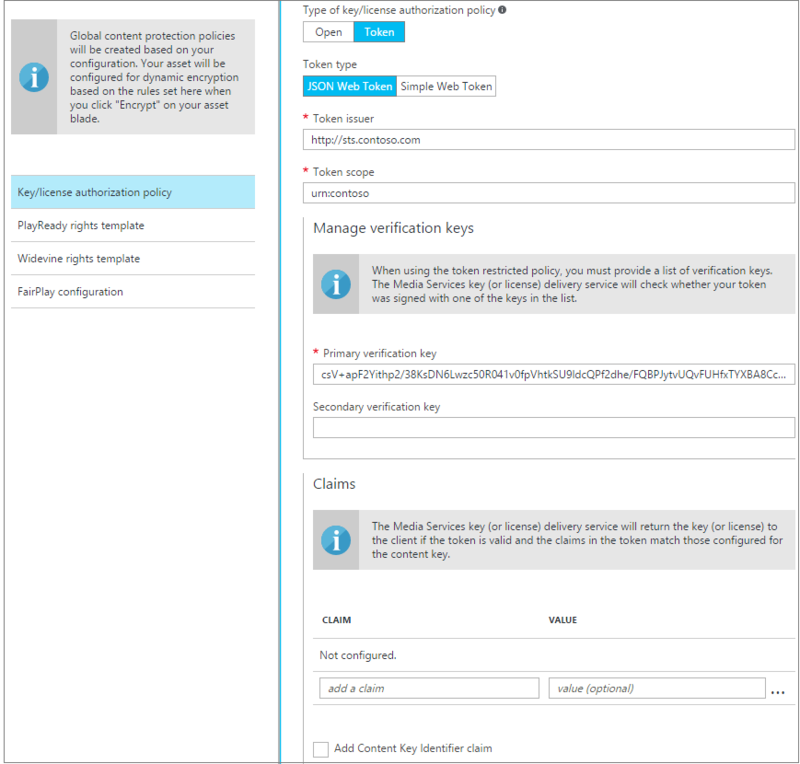 You can use the Azure portal to create one key/license authorization policy for all types of encryptions. 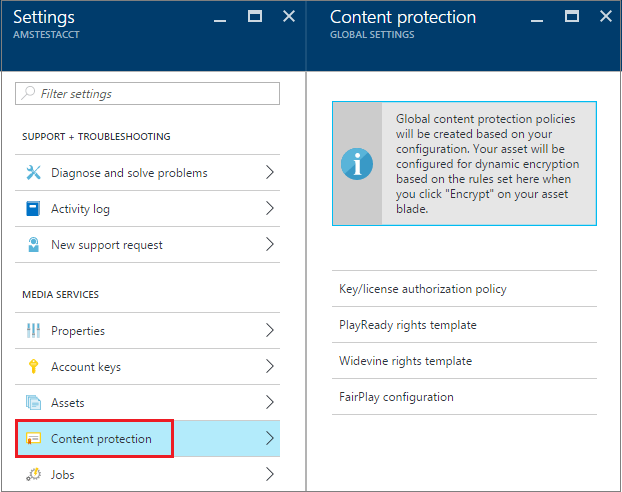 This article demonstrates how to configure a content protection policy by using the portal. The article also shows how to apply dynamic encryption to your assets. In the portal, select your Media Services account. Select Settings > Content protection. Media Services supports multiple ways of authenticating users who make key or license requests. You must configure the content key authorization policy. Your client then must meet the policy before the key/license can be delivered to it. The content key authorization policy can have one or more authorization restrictions, either open or token restrictions. You can use the portal to create one key/license authorization policy for all types of encryptions. Open restriction means that the system delivers the key to anyone who makes a key request. This restriction might be useful for test purposes. The token-restricted policy must be accompanied by a token issued by a security token service (STS). Media Services supports tokens in the simple web token (SWT) and JSON Web Token (JWT) formats. Media Services doesn't provide an STS. 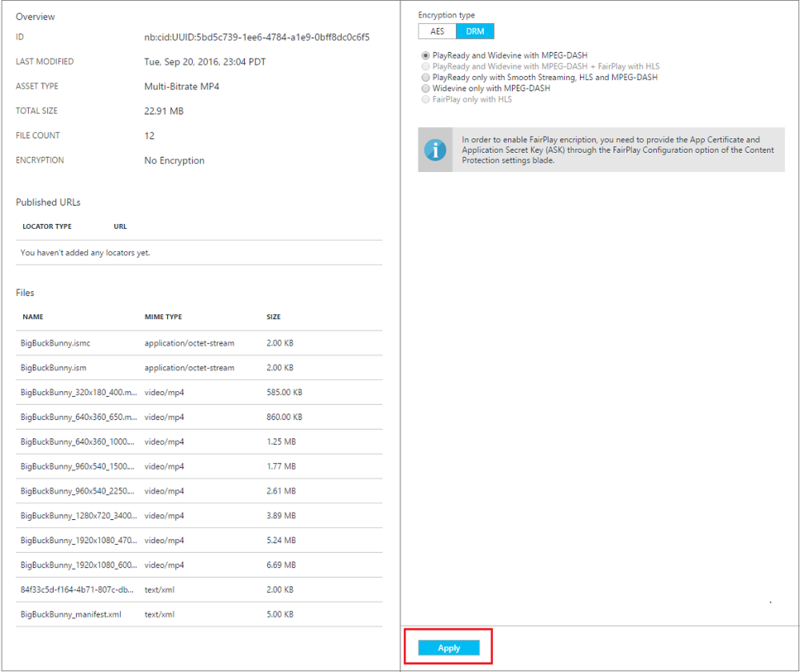 You can create a custom STS or use Azure Access Control Service to issue tokens. The STS must be configured to create a token signed with the specified key and issue claims that you specified in the token restriction configuration. If the token is valid and the claims in the token match those configured for the key (or license), the Media Services key delivery service returns the requested key (or license) to the client. When you configure the token-restricted policy, you must specify the primary verification key, issuer, and audience parameters. The primary verification key contains the key that the token was signed with. The issuer is the secure token service that issues the token. The audience (sometimes called scope) describes the intent of the token or the resource the token authorizes access to. The Media Services key delivery service validates that these values in the token match the values in the template. 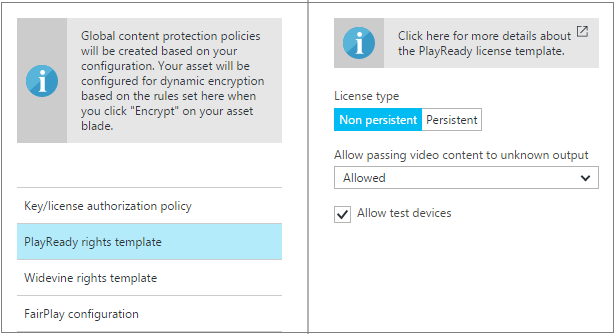 The PlayReady license template sets the functionality that is enabled on your PlayReady license. 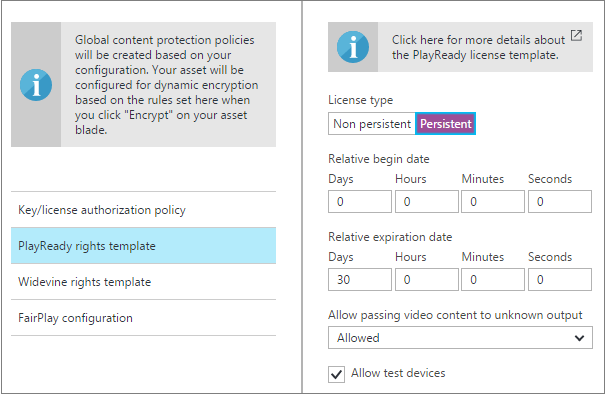 For more information about the PlayReady license template, see the Media Services PlayReady license template overview. If you configure a license as nonpersistent, it's held in memory only while the player uses the license. If you configure a license as persistent, it's saved in persistent storage on the client. The Widevine license template sets the functionality that is enabled on your Widevine licenses. When you select Basic, the template is created with all default values. 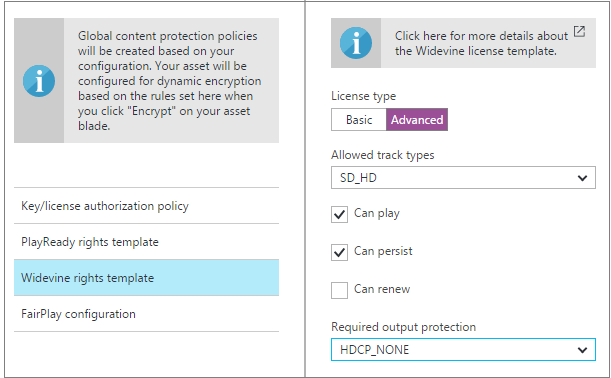 For more information about the Widevine rights template, see the Widevine license template overview. To enable FairPlay encryption, select FairPlay configuration. Then select the App certificate and enter the Application Secret Key. For more information about FairPlay configuration and requirements, see Protect your HLS content with Apple FairPlay or Microsoft PlayReady. 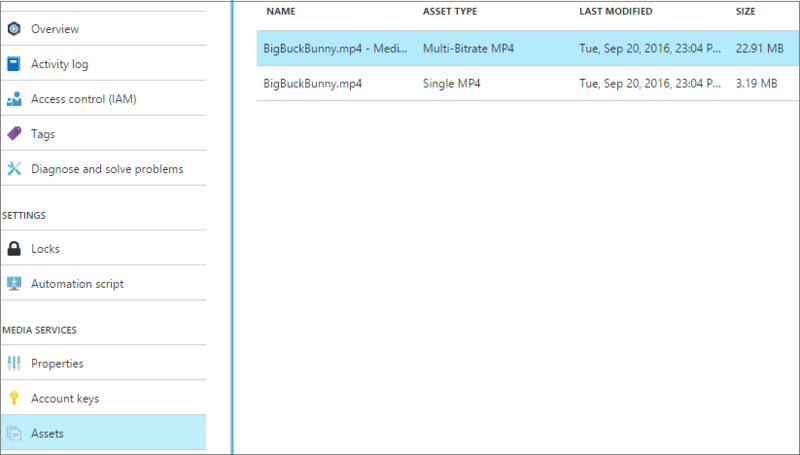 To take advantage of dynamic encryption, encode your source file into a set of adaptive-bitrate MP4 files. To see all your assets, select Settings > Assets. When you select Encrypt for an asset, you see two choices: AES or DRM. 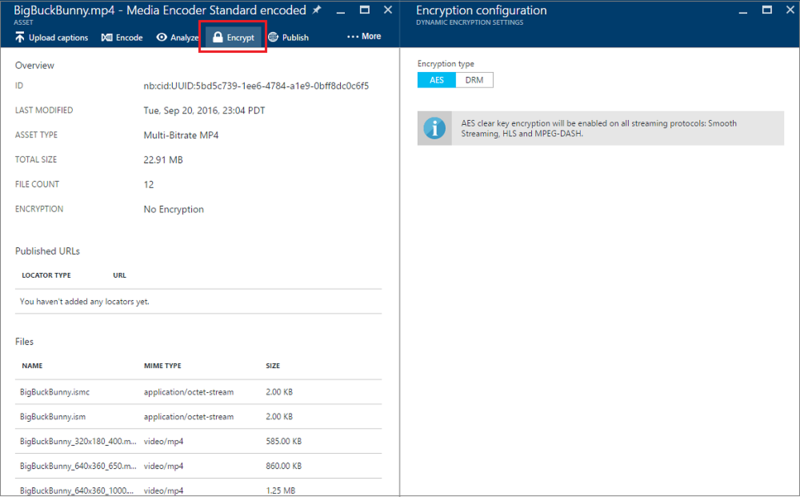 AES clear key encryption is enabled on all streaming protocols: Smooth Streaming, HLS, and MPEG-DASH. a. PlayReady and Widevine with MPEG-DASH dynamically encrypts your MPEG-DASH stream with PlayReady and Widevine DRMs. b. PlayReady and Widevine with MPEG-DASH + FairPlay with HLS dynamically encrypt your MPEG-DASH stream with PlayReady and Widevine DRMs. This option also encrypts your HLS streams with FairPlay. c. PlayReady only with Smooth Streaming, HLS, and MPEG-DASH dynamically encrypts Smooth Streaming, HLS, and MPEG-DASH streams with PlayReady DRM. d. Widevine only with MPEG-DASH dynamically encrypts your MPEG-DASH with Widevine DRM. e. FairPlay only with HLS dynamically encrypts your HLS stream with FairPlay. To enable FairPlay encryption, on the Content Protection Global Settings blade, select FairPlay configuration. Then select the App certificate, and enter the Application Secret Key. After you make the encryption selection, select Apply. If you plan to play an AES-encrypted HLS in Safari, see the blog post Encrypted HLS in Safari.